The Cotswold region has inspired some of England's finest composers. Edward Elgar lived in Worcester and also stayed in Broadway village - at the time of The Broadway Group of Artists. Gustav Holst lived in nearby Cheltenham and completed the Cotswold Symphony in 1900 while touring as a trombonist with the Carl Rosa opera company. The second movement of the work, an elegy, was written by Holst in honour of William Morris, the leader of the Hammersmith Socialist Club at the time. In the early 1900s, Herbert Howells and Ivor Gurney used to go for long walks together over the hills and Gurney urged Howells to make the landscape, including the nearby Malvern Hills, the inspiration for his future work. Accepting, and true to his word, in 1916, Howells wrote his first major piece, the Piano Quartet in A minor, inspired by the magnificent view of the Malverns - it was dedicated to "the hill at Chosen (Churchdown) and Ivor Gurney who knows it". Another contemporary of theirs, Gerald Finzi, lived in nearby Painswick. Cantores is one of the Cotswolds’ most accomplished amateur chamber choirs, founded in 1991 by local choral enthusiasts keen to take the step up beyond choral society and church choir and aspiring (although with humble realism) to the standards and repertoire of The Sixteen, for example, or the Monteverdi Choir. Over twenty years, we have gained a loyal and growing following, performing music that is challenging and enjoyable, combining familiar favourites with works that are relatively new or not often performed. We usually perform six or so concerts a year, one of them a cappella and two with the accompaniment of the Cantores String Ensemble drawn from local professional musicians. Our members come mainly from Cirencester, Cheltenham, Swindon and villages in between, and we rehearse on Wednesdays in term time, at Rendcomb College (on the A435 between Cheltenham and Cirencester) from 7:30 to 9:30 pm. Prospective members are invited to join us for a couple of rehearsals and then there is an informal audition. A reasonable level of sight-reading ability is expected. 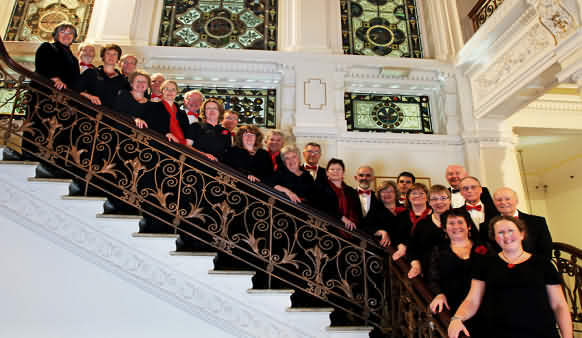 Cheltenham Choral Society is an amateur, mixed-voice choir based in Cheltenham, Gloucestershire. Morgan Islwyn Jones, who remained the Society's principal conductor until 1973, founded Cheltenham Choral Society in 1938. Under his baton the Society achieved an ambitious repertoire that attracted many international solo artists of great distinction as is recorded in the Society's archives. triumphant Golden Jubilee in 1988. The Society's association with lan Higginson had already been established when he was appointed Musical Director and Conductor in 1989. Much rejoicing stemmed from the Society's association with past member Dame Felicity Lott who became President of the Society in 1993.
performance of Handel's Messiah at the Town Hall with Dame Felicity Lott as soprano soloist, attracting a near capacity audience. During 2009 the Society gave a series of performances celebrating the anniversaries of various composers: the 250th Anniversary of Handel's death, the 200th Anniversary of Haydn's death and the 350th Anniversary of Purcell's birth. Cheltenham Choral Society believes that singing is good for all. Whether you are 7 or 77, singing together engenders a sense of well being and community. Encouraging youngsters to perform in public brings all sorts of benefits and is something the Society is keen to promote. Children" in Tewkesbury Abbey in 2008, working with local school choirs, the Society has looked around for more opportunities to sing with children, and is keen to promote musical awareness by giving children the opportunity to perform. With works for a choir of mixed voices and children proving difficult to find, the choir has turned to its own Musical Director, lan Higginson, to create an original composition of which the outcome was "SHADES OF JAZZ" based on movements of a sacred mass, sung in Latin and set in a jazz genre. 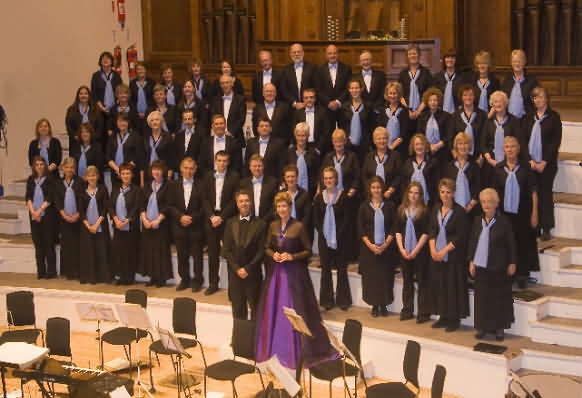 The first performance was performed at the Springtime Gala Concert in April 2010 at Cheltenham Town Hall. Beauregard Youth Choir, Charlton Kings Junior School Choir and Leckhampton Primary School Choir and a Jazz Ensemble joined Cheltenham Choral Society, and Tewkesbury Town Band added its own distinctive sounds of music. 2011 saw the Society promoting a Choral Workshop by Bob Chilcott as well as performing Brahms “Requiem” an “Evening in Vienna” and finally Karl Jenkins, “Requiem” along with a new work by Ian Higginson “Reflection upon a life”. We rehearse on Wednesday evenings from 7.30 to 9.30 pm at Bethesda Methodist Church, Great Norwood Street, Cheltenham. You are welcome to come and sing with us for a few rehearsals and see how you like us! If you have some sight-reading ability you will find this helpful, but it is not essential. Auditions are not required on first joining the Society, but any member may be required to submit to voice tests, as deemed necessary by the Musical Director through the Committee, or by a Committee member. If you would like to talk to someone in the choir before you attend a rehearsal, please email us at info@cheltchoralsoc.org.uk or telephone: Tony White, Vice Chairman & Membership Secretary on 01242 527521. If you decide you would like to come along to a rehearsal, we can arrange for someone to meet you and introduce you to other choir members on your first evening. Longborough Festival Opera is an opera festival held in an opera house in the north Cotswolds village of Longborough, in Gloucestershire.The Festival Opera presents a season of high quality opera in the English Cotswolds each June and July. It began in 1991 as Banks Fee Opera by presenting concerts, moved forward with operas presented by a travelling company, and that was followed by converting a barn into an opera house. Audiences grew rapidly in the 1990s and, during the last decade, a focus on Wagner's operas will lead to a complete Ring Cycle in 2013. At the performance interval guests are able to picnic in the grounds or under cover in a barn. The present chairman of the festival is Martin Graham, the music director Anthony Negus and the artistic director is Alan Privett. 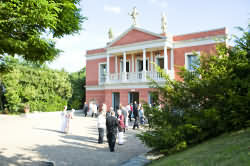 Address - Longborough Festival Opera, Longborough, Moreton-in-Marsh, Gloucestershire, GL56 0QF. Tel: 01451- 830 292. Web: www.lfo.org.uk. The choir's repertoire encompasses sacred and secular music from the 16th century to the present day. Jubilate has sung in many of the country's cathedrals and abbeys, including St. Paul's Cathedral, London, Liverpool Metropolitan Cathedral, St. Giles Cathedral Edinburgh, Bath Abbey, Westminster Abbey, Christ Church Cathedral Oxford, and the cathedrals at Worcester, Brecon and Hereford. It has enjoyed highly successful tours to Scotland, Holland, Belgium, Liverpool, Chester and in both 2007 and 2011 to Paris where the choir has sung Mass in the Cathedrale Notre-Dame de Paris and performed recitals at the Eglise St Severin, La Madeleine and the American Church, all in the centre of Paris. In January 2008 the choir recorded Christmas music in Liverpool Metropolitan Cathedral - the organist was Richard Lea. The CD Nowell, Nowell! is now available from choir members. As well as its Paris tour, one of the other highlights for the choir in 2011 was the filming of a clip for the BBC's One Show which was screened in August 2011. See Latest News for more information.